Hello - I very much appreciate any assistance the forum is able to offer. I recently upgraded from a basic restoration 8x12 Arab press to a beautifully restored 1907 C&P that the previous owner shipped and restored from the US. I was expecting the treadle and motion to be a lot heavier, but I’m getting two significant clunks in the action that is preventing any momentum when using the treadle… One when the treadle is at the top and downward pressure starts and again when it gets to the bottom. When I remove the treadle and spin by hand there is nothing (I have tried to attach a video but not sure if it works). 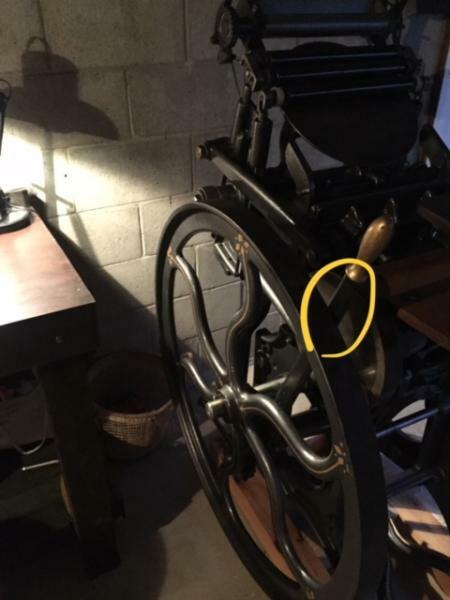 The treadle does not seem to be hitting anything, but is maybe jumping around on the shaft? I thought maybe the hook might be misshapen, but it looks good (photo). Even the Arab, with all its lumps and bumps, was a lot smoother and able to treadle for quite a while. My husband (an avid YouTube mechanic) thinks some grease and oil might do the trick, but we did this yesterday with no success. I was also wondering if there is any way to create more distance between the inside of the wheel to the impression lever? Everything being connected i really don’t know where to start! 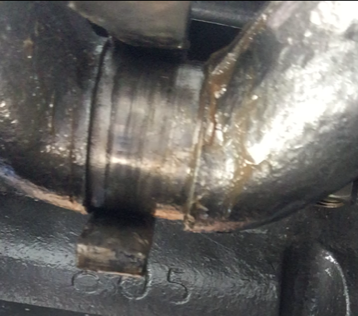 A few pointers that may help:- normally sheer gravity holds the connecting rod in contact with the crank pin.! Does the foot pedal rise and fall freely, implying that if is not reasonably well lubricated, the weight and momentum of the flywheel will drag it (the connecting rod) UP on the up stoke, and then try to leave it (the open ended hook behind) because it has not dropped, perhaps cycle the machine slowly by hand and watch to see if the hook and crank pin remain in contact through 360 degrees of the cycle. As a simple test cycle the m/c by hand, until the connecting rod has been pulled upward to the point where the crank pin is at its highest point, place a block under the treadle peddle, continue cycling by hand, the crank pin WILL continue downwards and leave the con rod behind, just catch/support the Rod (top end) and check for friction free movement of the *EYE* around the small arc of the pin on the treadle pedal. Of course generous lubrication whilst static, Helps. Here U.K. it was not uncommon to have a replacement Hook beaten/fashioned by the local blacksmith, + as a temporary measure, (when the hook and eye had taken a beating and lubrication had been seriously overlooked) we just lined the eye of the hook with ordinary plumbers lead, with just a touch of Copper-slip Grease or High melting point Grease. The square key (small pinion gear to main shaft) appears to be a little too far out, perhaps a gentle tap in with tiny hammer to ascertain, if it be loose, perhaps inspection of the inner end of the key with a dentist mirror and flashlight may help/prove or disprove,? The small pinion gear (as far as can be seen) appears to be out of line, from an overhead perspective, should be in perfect alignment with the large gear wheel, so that the teeth mesh respectively 100% across the width, has the key worked OUT or has the pinion worked IN. Generally where parallel keys are involved, when positioned correctly a tiny grub screw is incorporated, either in the key directly OR a tiny grub screw is threaded into and through the pinion gear, which often has a small abutment/extension machined in (in manufacture) to accommodate such screw, is there such extension at the rear of Your pinion gear, with loose or non existant grub screw.? Does there appear to be a gap between the rear of the pinion gear and the frame of the M/c. implying lost or missing spacer, leaving the pinion free to float too much.? Here (U.K.) where parallel keys are involved, as they are intended to be sacrificial to protect the gear(s) and the shafts, we substitute with tapered Gib Head keys, normally with a nominal taper and then filed to fit,! Gib head keys, usually retained with conventional mechanics/engineers >threadlock< or similar, long term securing but can be withdrawn via the *Gib* head, either with 2 small opposing wedges or minature slide hammer. The above just offered as investigative clues, hopefully to prompt good info. Thanks so much for all the advice Mick! Can I email you the video? I did wonder about the alignment of the cogs and the key spacing in the pinion. Will inspect the key and tap in if required, is the key meant to be recessed into the cog as well? Or just sitting tightly in its bed? How do we go about cog alignment adjustment – do you think this could cause the clunk? There does not appear to be a spacer between the pinion and the machine frame. The treadle does rise and fall “freely” – (i.e. if I am spinning the wheel with no foot pressure it moves up and down)– but much more difficult due to whatever resistance is causing the clunk. We have watched closely when rotating and there doesn’t seem to be any lift of the rod/hook –I have well-greased and the hook appears to remain in contact with the crank. The machine is elevated on blocks. •	I will try your test to hold the treadle and hook in place at the top of the cycle to see if there is friction in the pin. Do you suggest lining the eye of the hook with plumbers lead? I noted in another forum discussion someone used nylon to reduce friction from a “hook” fashioned out of springs and U-Bolts…. Ill provide an update when I’ve investigated the rest of the items. Thank so much again for your insight! I have taken some more photos. The pinion gear is approx 10-11mm closer to the machine frame than the larger gear (photo). This might seem like a silly question, but how do we go about moving it back into place? remove the key???…. and….??? There is no spacer behind the pinion, but the machine frame is moulded to sit it out from the main frame (photo). The pinion is sitting up to this moulding. Dani, Yes the pinion gear is badly out of line, and should by completely parallel tooth for tooth, in Your 6133 shot the >out of line wear< can be seen on the teeth, from the 4th.5th.6th. onwards, less so on the pinion, as the pinion gear is usual considered as the most vunerable and sacrificial, it may well have been replaced, perhaps loosing a collar/spacer, en route, possibly at the same time as the key was replaced, but in any case the Key should occupy the entire internal length of the pinion, cog, etc. As the pinion appears loose it should pull fairly easily, with just a minimal turn of the centre bolt with the appropriate Ring Spanner/Wrench, if there is too much resistance, it is quite normal when pulling, once under tension, to tap the centre bolt, to shock the Pinion, Cog , Gear into submission, Copper or Hide hammer of course. As the pinion appears to be less than tight fit, it is possible and we have on occasions, extracted pinions, cogs. etc., by just using 2 normal quoins (where clearance permits) behind the pinion, cog., etc., at 180 degrees, and merely *Pushing* the item off, progressively, exactly as locking up a forme/chase of type etc. but in reverse. If the fitted key pulls out and off, no problem, pull the pinion right off, inspect the inner keyway slots of the pinion and the shaft, for minute burrs/obstructions, a small needle file works well, ascertain if possible, and see if the key was in fact working along the entire available length of the keyways, maybe tell-tale marks proving otherwise, the key would normally expect to be seen, with a small contoured end to match the contoured end of the slot in the shaft keyway. We believe that Your hardware supplies, McMaster etc., have an excellent range of (off the shelf) keys, Parallel, Tapered, Gib head, Woodfruff and more.!! Here U.K. we would source a number Keys, the correct size for the appropriate slots, i.e. in the order of 1/4” to 3/8” and file to fit, to accommodate wear in the slots, not too difficult, usually (keys) gripped in an ordinary bench vice and filed to suite, frequent test offering up, of course, with Keys, metaphorically, @ ten a penny, one or two failed experiments, all good for the learning curve. Replace the pinion gear, with remanufactured key, if poss., [including few drops of Engineers/Mechanics Threadlock,] but as implied, with spacers to retain the pinion in correct alignment, we have in the past used a combination, of Brass, Stainless steel, and Nylon or Fibre washers as spacers, brass and nylon are an excellent combination. Occassionally with a small flat serrations filed across the face(s) of the brass piece, to act as oil channels. Always helped. With the weight of the flywheel (usually) located on the opposite side to the pinion, there is a fair amount of side thrust. Where practical and possible, we always try to position the flywheel as close as practical to the mainframe and bearing, the flywheel, even when properly balanced, exerts a lot of downward thrust and pressure on what is normally a plain bearing. Apologies (once more) but maybe take a close inspection of the stub Axle/Axis around which the Hook of the connecting partialy revolves, looking for, *not to clever* replacement or repair, should appear as a bright shiny ended stub, does not look quite correct. ? Sorry to pose possible future troubles, but as we say U.K. forewarned is forearmed, because it will NOT give up on the last impression of a big run.?? Ahh Mick you are a wizard! Dani, thank You, but probably more bordering on the eccentric, but passionate with it, from better than 65 Yrs. of learning on the journey, circa 1939. Indentures signed off with effect, August 1954. Still grateful and appreciative for learning the rudiments of Letterpress on the Schools Adana. More than fortunate during 2 years Conscription, (draft I believe You call it Stateside) Met many amazing U.S.A.F Guys, (U.S.A.F. & R.A.F. outfits often occupied same base(s). but more to the point, if/when conscription caused a glitch in the chosen trade, (Inc Authors) where practical for the last six months, the R.A.F. paid for one day per week for day release, to relevant College Tech.etc. Author based at R.A.F. Uxbridge (W.W. II Bunker Command Post, now preserved.) not too far out of London, permitted to attend THE Monotype School in London, for refresher course on the Monotype, and was given the chance to look into Reverse delivery on the Monotype, FOR Arabic and Hebrew typesetting, which is in fact not just reverse delivery, Upside Down & Back to front, but reversed again on the Monotype, I.e. Upside down and back to front, but ALSO reversed, yet again to deliver down the Galley right to left above the normal mechanism, as opposed to left to right delivery, several good Videos on Google and U tube etc., Monotype running. Probably also explains my admiration for Your Elizabeth Cotton, (Amazing Lady) playing the Guitar upside down and Back to front, & without restring the order of the strings. O.K. some of the modern guys/gals/guitarists are playing upside down and back to front but always appear to change the order of the strings, to hit the bottom *E* first, not Elizabeth, She did it the hard way, look up Elizabeth Cotton and >Freight Train< Became a protégé and Friend to Your Pete Seeger. Haha will do! Good to see getting married at 9yo didn’t hold her back! But I am in Australia (the C&P was shipped over some years ago) - any hot tips on eccentric characters here? Dani, Best I can offer is Moana Press, N.Z. rather than Oz. but very dedicated, bordering on passionate, hopefully, ? + Our David and Claire Bolton @ the Alembic Press, (here U.K.) amazing Archivist,s and Compilers of letterpress related info, but more to the point, we believe,! have interests in Oz., and frequently visit Down under. Very passionate, and very dedicated, listed and easy to contact. *Long time fan of the late, David Gordon Kirkpatrick.?? Well the good news is I’ve moved the pinion! Tried first the quoins with no movement so sourced a multi-leg puller which did the trick. I’ll try to upload photos of all treadle associated parts. I’ve asked a local print studio who may be able to take a look as well. My press lever now is unfortunately touching the fly wheel. I recall I had a similar cluck in a press which was caused by the flywheel being somewhat loose on the shaft. At every revolution, the flywheel shifted, and made a noise. You might look for something which moves in time to a particular revolution of gear or wheel as the press runs. It looks like your flywheel is well pinned in place, but the key might be worn, causing the wheel to jump at some point, causing the noise. For what it is worth: I have an 8x12 which I acquired along with a 7x11 and some other printing equipment. My 8x12 did not have a treadle hook so I used the one off the 7x11. They are not the same size, the 8x12 is shorter than the 7x11 so the revolution is different. I get an added pause along with the one built in when the flywheel rotate as designed, counter clockwise. I don’t know the history of your press but this is worth considering. Good luck. Thanks John - The fly wheel is nice and secure, and the key in great condition. Foothill - I do think the hook length may be a factor… I would be grateful for a pause over this very loud clunk! With the hook held in place I get some up and down movement of the treadle on the bolt that connects it to the hook bar, as well as in the hinge that it sits on at the rear (side to side). On the bolt, while only 1mm of space, this does create a larger range of movement out at the tread, and with momentum, this little jump could be causing the clunk??? I can feel it in my foot while the noise is occurring elsewhere. It makes me wonder if the bolt is slightly too thin (should it entirely fill the cavity? ), or the bar slightly too long (not sure what to do about that…)… we are headed to the hardware store for a thicker bolt to see how this plays out. This forum has been a great help, and I’m learning a lot about my press in this process. I have added the full view of the machine for you all (before i moved to my home) - is a very pretty thing, and other than this is in excellent shape. Probably a metric bolt, in an imperial diameter hole,! and probably torqued up too tight to compensate, as witness the crushed spring washer, would expect to see, appropriate bolt torqued up just sufficient with nut and locking nut.! Simmonds Nuts or *Nyloc* for example. NO micrometer, NO caliper Vernier, - No problem !!! just 2/3 twist drill bits,1/4” 3/8” etc. the shank, (not the flutes) gives perfect test tool. OK - here’s the latest! - we sourced a slightly larger (next size up) imperial bolt but was too big - so the current size is the largest that will fit. - we suspected the hook length or hook - however from another suggestion we ran the treadle with just a looped over ratchet strap as the “hook” and the clunk still occurred… so this (mostly) rules out the hook as culprit? Can be quite safe to assume is either the relationship of hook to treadle or the treadle itself?? - we have checked all possible contact points. neither the treadle or the hook hit the frame in rotation… and the sound is off-time for these events. The sound is more a movement clunk/jump rather than a bang or grinding. I do see the large cog/gear jump in time with the clunk. - there is a lot of wobble/swing in the treadle both either side of the hook eye where attached to the treadle - as well moving side to side on the back “hinge” bar where the treadle pivots. Is this normal to have so much wobble in the treadle or should we pack with washers to reduce? A piece of “crud” in between a couple of cogs is a frequent ocurrence with gear trains that are open-access like these. My money would be on a small space or type character that somebody dropped. It would get mashed in and stay there until somebody digs it out with a dentist tool. Operate the press slowly, possibly without the ink disk and/or rollers. Listen carefully… perhaps with more than one person doing the listening. You should be able to locate the noise by triangulation. This will lead you to the piece of type, mud-dauber wasp nest or broken cog. The more complex the machine, the harder it is to find a noise. I am reminded of an old Bill Cosby sketch about his automobile in which the mechanic prclaimed that Bill had “somethin’ hittin’ in there”. I’ve heard a stethoscope is good for clunk hunting! I received a reply from the previous owner who said the clunk has always been there and she simply persevered printing with it…? I’m sure if I move into a shared space this would be a problem. Where are the bearings? On the main shaft? Would this be affected more by treadle being attached? Gear teeth are all clean! The most puzzling thing is it only occurring with treadle attached.. Does the clunk happen in both directions? You have some very important information. You say that the sound only happens with treadle attached. Do you mean treadle, or treadle and hook? If you mean treadle without hook, you have it even further narrowed down. If you don’t have the sound with treadle alone, you really have it narrowed to the hook. In troubleshooting it is important to eliminate the things that are not causing the problem to get to the one that is. A good substitute for a stethescope is a long screwdriver. One with the steel shank running through the handle is best. Others will work also. Place tip on part to be examined and place handle in ear. Have assistant turn flywheel. Be very careful as the parts move. Rock flywheel back and forth through clunk. Look and touch to see/feel what moves. Now get some ink on your shirt. If the clunk has always been present, it makes me wonder if there is something improperly machined. I still suspect the gear train. Make a mark one the large gear, then operate the press, If the clunk always happens when the mark is in the same position, look where the gears mesh when the mark is in that spot. If it is a gear problem, that’s where the defect will be. If the clunk happens when the mark is in a different spot, but is consistent, say three clunks per revolution of the large gear, it would indicate that the defect is in the small gear. Machining a gear is very exacting work. If one cog is cut wrong, it can and will cause somebody grief. If it isn’t a gear problem, then I haven’t a clue, but it should be fixable. Also… when you find the source of the clunk, let us all know! - we took the hook away and operated treadle with a ratchet strap - still clunking so eliminated hook alone as cause. Thanks all so much for your help! Will definitely keep you all updated as we progress! so looking at photo 6135, there is about 2 inches of the shaft extending out past the flywheel and a similar extention out past the pinion on the other side of the shaft, photo 6133. We have clunking sound at top and bottom of treadle cycle and throwoff handle touching flywheel. Is it possible that the shaft is misaligned from side to side so that the treadle hook is not centered in the crank section of the shaft and is bumping against the side, or forcing the shaft to the side each cycle? You might try wrapping the treadle hook with a tight layer of masking tape or something, install it and run it a few cycles and then examine it and see if there is a mark where it bumps against something. Thanks Bruce for the suggestions! We ended up adjusting the fly wheel, so better distance between the throw off handle and wheel. It appears the crank shaft is centered - but i suppose it would only take a very small difference to cause the movement. The hook does have a tendency to sit over to one side of its channel. Will take some measurements to see if properly centered. If it does prove to be out - how on earth do you move the shaft? That sounds like a major operation. I posted the question after reading your narrative and I gave what I thought might be a usable method to determine if there was metal rubbing in that location. Until you have determined the cause of the noise, definitely keep looking. We had an interesting development a couple of days ago - while we have not resolved the clunking matter, when I was operating the press by hand - the clunk began to occur only lightly WITHOUT THE TREADLE ATTACHED! I was very surprised as this is the first time it has happened - though I have not spent as much time on hand operation as I did the other day. A new issue is that during hand operation, the press is becoming very hard to move at the close, i.e not going through the full range without getting stuck. I’m going to browse the forum discussion for related topics on this. i have a completely different printing press than you (golding pearl 11), so this probably won’t be much help, but i wanted to throw it out there anyway. we had a mystery clunking noise a few weeks back. it would come and go and was hard to pinpoint, kind of like yours. it turned out that the throw off lever needed to be adjusted. when engaged, it didn’t quite sit all the way down in the saddle and would make the noise as it jumped, ever so slightly. I know this discussion has gone on for a while. When you mention lock up it reminded me of the 2 or 3 times I have locked up my 8x12 C&P. It was caused by trying to print on extra thick paper. It is whether caused by too much impression or excessive packing. Your impression bolts should be set at type high with whatever packing you will be using. If it is.035, when the press closes on impression, a piece of type should fit snugly between the bed and platen. If it will not, the impression is already to tight. If it makes a thud, that is the reason. If you print on 300 gsm or 600, you are adding that much more thickness. It should not matter whether it is treadle driven or by hand. While resulting on lots of blisters from hand operation I also noticed the Gib key (?) the one for the fly wheel is narrow in its bed. Possibly by 2-3mm thinner than the space allowed for it - which is significant. I have everything crossed that this is the source of the original problem and have ordered a larger key to fill the space and keep the wheel secured in full rotation. Re; the tightening on close - I have successfully leveled the platen and am getting a nice smooth rotation with no sticking. Do let us know. As I indicated on Sept. 6, this is one thing which should have been checked. The same clunk plagued me on an old Kelsey Union Rotary Press with treadle. Tightened flywheel on shaft and the clunk left the building. John you were on the money! Unfortunately we were unable to see the shift until this one particular day when it caught my eye. The wheel otherwise seemed perfectly snug. Because of all of your advice I was able to see things others couldn’t if I was the one operating and they were looking/searching. It was a great tip and I’m glad you mentioned it. I have installed the new key today and am VERY glad to report we have NO clunk! Although I did get the key stuck half way in haha. But that’s one battle I’m happy to take on another day. For now I’m just enjoying the sweet accomplishment of my old girl sounding the way she should. Thank to all of you for helping me trouble shoot, learn other ins and outs and generally get to know my machine better through the process.